With the first chill of autumn came a desire for a rich soup. 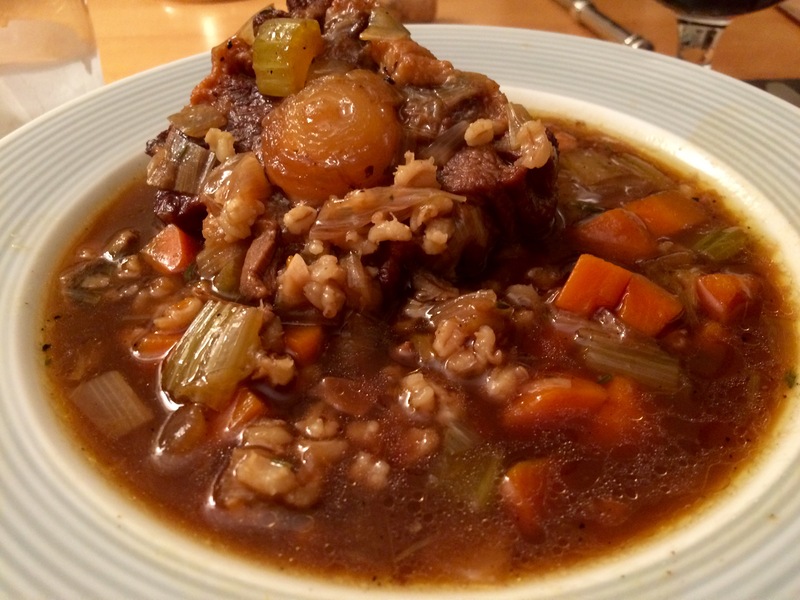 My better half asked for beef barley, a childhood favorite. So after searching my cookbooks and the internet, I came upon a great recipe from Food Network star, Ina Garten. Served along with the recipe’s oxtails, the soup makes a complete meal that will satisfy even the most ardent carnivore. It’s a relatively simple recipe, but I modified it slightly. The original recipe called for 10 cups of beef broth, but my local grocery only had two 32-ounce boxes available. Originally, I thought I would simple add some chicken stock to make up the difference. But then I thought that making up the difference with a broth made from soaking dried porcini would provide even more flavor with the added benefit of adding some mushrooms to the soup. I made my broth with a half cup of porcini, but regretted afterwards that I didn’t use more. So, as you will see in the recipe, I’ve upped the dried porcini to 1 cup. As you may have noticed, this posting has far fewer photographs than is my norm. This is because I wasn’t planning on posting this recipe until I first tasted the soup for seasoning about mid-way through. Heat the olive oil in a large pot or Dutch oven, such as Le Creuset. Add the oxtails, 1 teaspoon salt, and 1/2 teaspoon pepper and cook over medium-high heat, stirring occasionally, for 10 minutes until browned all over. 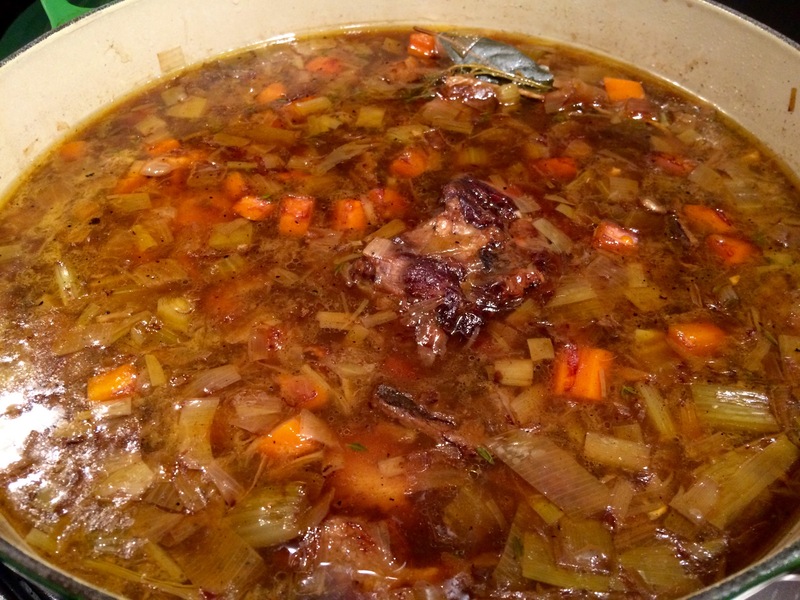 Remove the oxtails with a slotted spoon and reserve. Add the leeks, carrots, onion, celery, and garlic to the fat in the pot and cook over medium heat, stirring occasionally, for 10 minutes, until the vegetables start to brown. Tie the thyme sprigs together with kitchen string and add to the pot along with the bay leaves. 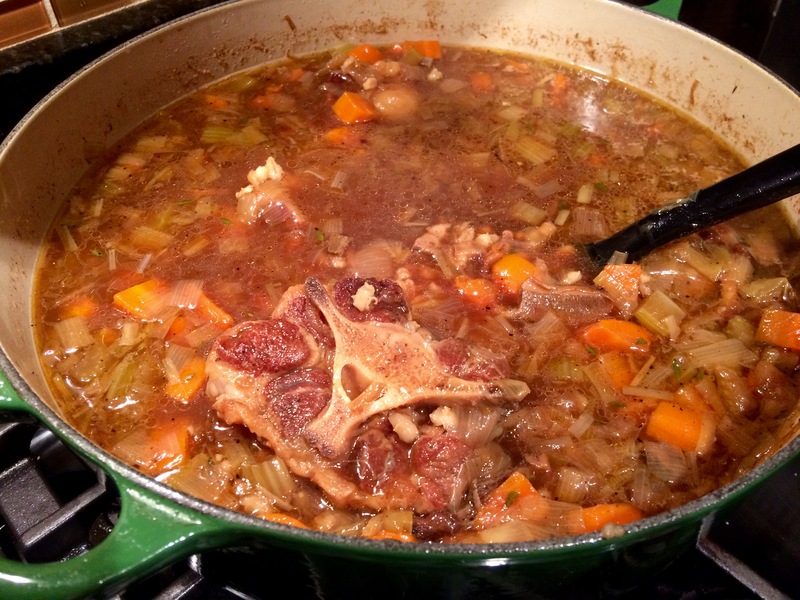 Return the oxtails to the pot and add the broth, the soaked porcini,1 teaspoon of salt, and 1 teaspoon of pepper. Raise the heat and bring to a boil. Lower the heat, cover, and simmer for 1 hour. Discard the thyme bundle and the bay leaves, and skim off the fat. When the soup is ready, add the barley and cook the soup for another 15 or 20 minutes, until the barley is tender. Depending on the saltiness of the stock, the soup might need another teaspoon of salt and some pepper. Serve the soup hot together with the oxtails in heated bowls. Soup was on the menu last night. 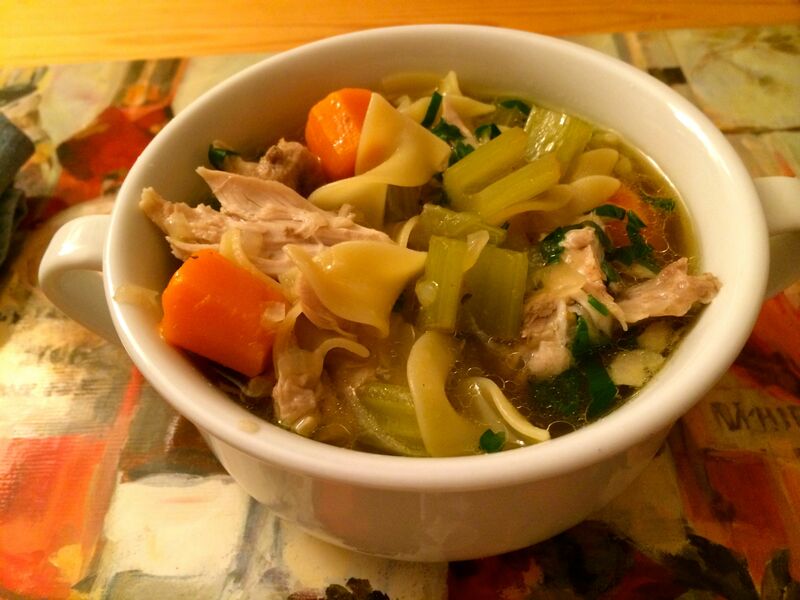 Nothing fancy, nothing exotic, nothing international, just plain, old-fashioned chicken noodle soup. Time constraints, however, led me to my pressure cooker, which considerably reduces the cooking time and, in my opinion, turns out a tastier, clearer soup than conventional methods. My recipe came from one of my go-to books for this type of cooking: Pressure Cooker Perfection from America’s Test Kitchen. Although the recipe at first glance would lead one to believe that the soup would be ready in 20 minutes (the time under pressure), in real time, including prep and cooking the noodles, it took about an hour. One ingredient, specifically soy sauce, gave me some pause, but it actually gave the soup a deeper meat flavor. And extra-wide egg noodles cooked in the finished broth added extra body. Heat oil in pressure cooker pot over medium heat until shimmering. Add onion (and a pinch of salt) and cook until softened, about 5 minutes. Stir in water, carrots, celery, and soy sauce, scraping up any browned bits. Lock pressure cooker lid in place and bring to high pressure over medium-high heat. As soon as the pot reaches high pressure, reduce heat to medium-low and cook for 20 minutes, adjusting heat as needed to maintain high pressure. Using a large spoon, skim excess fat from the surface of the soup. Bring soup to boil, stir in noodles, and cook until tender, about 5 minutes. Stir in shredded chicken and parsley, season with salt and pepper to taste, and serve.